According to Theo Haimann, Administration means overall determination of policies, setting of major objectives, the identification of general purposes and laying down of broad programmes and projects. It refers to the activities of higher level. It lays down basic principles of the enterprise. According to Newman, Administration means guidance, leadership & control of the efforts of the groups towards some common goals. Practically, there is no difference between management & administration. 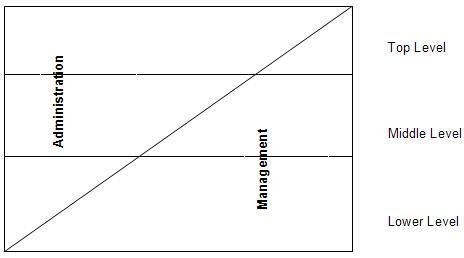 Every manager is concerned with both - administrative management function and operative management function as shown in the figure. However, the managers who are higher up in the hierarchy denote more time on administrative function & the lower level denote more time on directing and controlling workers performance i.e. management.